Barcelona striker Luis Suarez will miss the next two Copa del Rey games after failing in an appeal against his suspension. The 28-year-old Uruguay international is said to have provoked a fracas in the tunnel after last week's 4-1 win over Espanyol in the last 16 first leg. He said: "I am waiting for you, come here. You are a waste of space," according to the referee's report. Suarez will now miss Wednesday's second leg and their next Copa del Rey tie. 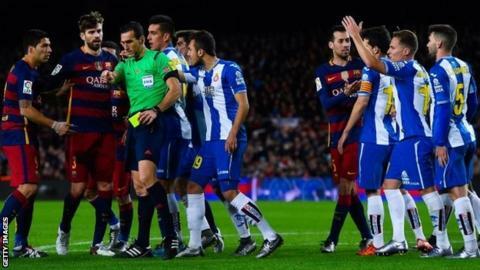 During a heated Barcelona derby, Espanyol had Hernan Perez and Pape Diop sent off, with the latter dismissed for an abusive comment aimed at Suarez. After failing with their appeal to Spain's football federation, Barcelona could still take it to the government's Disciplinary Committee for Sports (Tad).